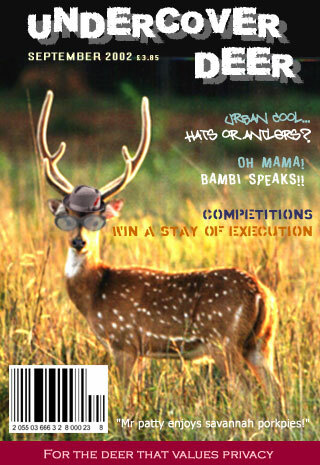 Whilst idly perusing the top shelf of my newsagent, I came across a copy of "Undercover Deer" magazine. I have always been fascinated by deer, and was curious as to how such animals would adapt to an urban environment. In my experience, deer resent being cooped up in sheds or kitchens, and get moody and depressed if kept indoors for too long. As I child I would often face the grisly task of executing unhappy deer - there is no room in a household for a deer that refuses to pull its weight. The magazine proved to be a pleasant surprise. There were handy tips on how to disguise your deer for a number of urban situations, from High Street shopping to garden parties and barbecues. There were also a number of true-life stories from deer owners around the world. It is always good to feel a part of a community.